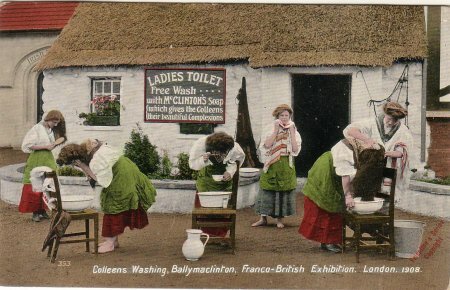 "Colleens Washing, Ballymaclinton, Franco-British Exhibition. London.1908". 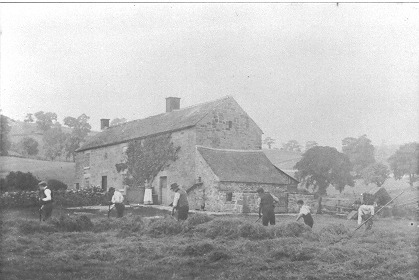 Haymaking at Pitty Wood Farm c1915, 2km NW. Sometime between May 14 and Oct 31 1908 Emily Redfern from Derby may have visited the astonishing Franco-British Exhibition and bought some postcards there. 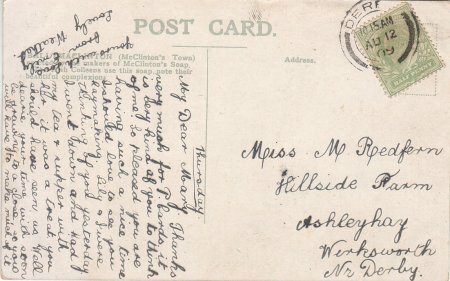 On Thursday Aug 12 1909 she sent this postcard to her sister-in-law at Hillside Farm, Taylor's Lane in Ashleyhay, farmed by her parents (OS ref SK297516). Thanks very much for P.Cards. It is very kind of you to think of me. So pleased you are having such a nice time. I should love to see you haymaking. Lily & I were thinking of you yesterday. I went down and had my tea & supper with her, it was a treat you should have seen us. Well dearie your time with soon be drawing to a close, so you will have to make much of it. Mary Redfern (single, age 34) was staying at Hillside Farm, possibly with her parents who may have been tenant farmers there. Emily Redfern (married, age 44) was living in Derby. See the Redfern family. At Hillside Farm in August, haymaking would have been in progress; waiting for the weather and everyone giving a hand. 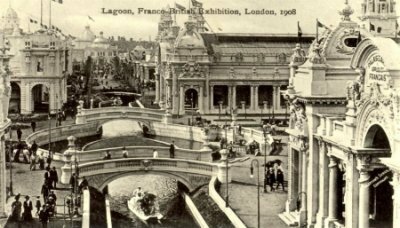 The Franco-British Exhibition (1908) was a large public fair held in London in the early years of the 20th Century. The exhibition attracted 8 million visitors and celebrated the Entente Cordiale signed in 1904 by the United Kingdom and France. The Exhibition was held in an area of West London near Shepherd's Bush which is now called White City: the area acquired its name from the exhibition buildings which were all painted white. The Olympic Games were held in the district alongside the festivities. The fair was the largest exhibition of its kind in Britain, and the first international exhibition co-organised and sponsored by two countries. It covered an area of some 140 acres, including an artificial lake, surrounded by an immense network of white buildings in elaborate (often Oriental) styles. The most popular attractions at the exhibition were the two so-called "colonial villages" - an "Irish village" and a "Senegalese village", which were designed to communicate the success of imperialism. The Irish village ("Ballymaclinton") was inhabited by 150 "colleens" (Irish girls) who demonstrated various forms of domestic industry, as well as displays of manufacturing and even an art gallery. The "Senegalese village" was a so-called "native village" displaying day-to-day life, as well as various artefacts. Press reports commented on the "surprising cleanliness" of the Irish, while readers were reminded that the Senegalese were "cleaner than they looked". The hay harvest in Derbyshire, writes a correspondent, has now been commenced in many districts, but during the past few days the weather has been of such an unsettled character that further operations have been somewhat delayed, and the farmers are busy with that already cut. On Saturday, towards evening, the county in some parts was visited with a thunderstorm, and the weather on Sunday was dull and threatening. The crops, speaking generally, will not be anything like so heavy as last year - an exeptional season. In the Southern part of the county some capital crops are promised with settled weather. The harvest in North Derbyshire will be late and poor. The season has been of a very uncertain character- often wet and generally stormy. The absence of sunshine has been a marked characteristic of July certainly. Very little hay has been got in yet, although the crops are generally good in this district, and indeed some of the farmers have so much of last year's hay left that they can afford to let the present season's hay wait longer. The wheat and seed crops in this part promise better than the hay; clover and dilla are looking well. The hay harvest is behind, and the corn, which is looking well, will also be late this season, except the voming month (August) is hot. The agricultural look out for 1890 is really promising and encouraging at this time. Some wheat and oats belonging to the Butterley Company in the immediate locality of Ripley look really magnificent. Oats and barley cannot be said to be backward. The potato crop will yield well, and no signs of disease are yet manifest. As to the root crops we must speak favourably of them, mangolds, turnips and swedes looking well. No Hessian fly has made its appearance in this locality, and no pest of any other kind has been observed sufficiently to inflict any serious damage. The hay and corn harvests for 1890 promise well. HARVEST PROSPECTS - The hay crops in this neighbourhood have left very little to be desired by farmers. The yield has been good, but hardly up to last year's heavy crop; but what deficiency exists in quantity has been made up in the excellent quality of this year's hay crops. The hay harvest, by reason of the unsettled weather, will be quite a month later than usual, but already a large proportion of the hay in this district has been stacked in prime. This neighbourhood is essentially a grazing district rather than a corn-growing district, consequently very little arable land is to be found. The reports of the condition of the corn are very favourable, farmers speaking of it as looking "first class", and bidding fair to be a very good crop both in ear and straw.. It is satisfactory to note that no blight has been observed. Green crops are not extensively grown here, but what few there are they have done very well. The potato yield is very favourable, and no disease has as yet been noticed. The fruit yield is a good average one. Farmers will not be short of keep for the coming winter. The difficulty appears to be on the score of getting stock whilst high prices are maintained. These are just a few typical references, which suggest that the season varied quite a bit according to the weather. I did not pick up anything useful for 1900, which is as far as the 19thC newspaper database goes for the Derby Mercury. A much later source, �Farming in the Midlands� by Stephen Williams (1967) says that haymaking proceeds in June & July, and if it rains the work is suspended until the top of the swath is dry. By then of course the process was mechanised. Very long, detailed and lyrical descriptions of the hay harvest are given by Alison Uttley of Cromford, harking back to the 1880s and 1890s when Irish labourers came over to get the hay in. (They ceased coming over in about 1914). In particular see the chapters �Mowing-time� and �Harvest� in �Carts & Candlesticks�, 1941, and �The Stack-yards� in �Cuckoo in June� (1964). The latter goes into great detail about the preparation of the stacks, and how a third was prepared for an unusually good harvest. Frustratingly she is very vague as to actual months, telling us only that the stackyards were prepared in March or April when the last of the old hay had been used. I have not been able to find any references to the actual farm you mention, either in our indexes or in the 19thC newspaper database. Overall it sounds as though 12th August would not have been unusual, depending on the weather. I hope they were not too near the grouse moors! Compiled, formatted, hyperlinked, encoded, and copyright © 2010, All Rights Reserved.